A final year student at the Dublin Business School (DBS) is seeking participants for a study that aims to enhance our understanding as to why some parents of ADHD children choose to trial medication and why others decline. Participants must be a parent of an ADHD child (under 18 at the time of diagnosis) who was diagnosed between the years 2000 and 2014. Participants are asked to fill an online questionnaire that will take approximately 2-3 minutes to complete. The study has been reviewed and approved by the DBS ethics board and all responses are anonymous. For more details please contact INCADDS. The Ombudsman, Peter Tyndall, has today welcomed the steps taken by the Health Service Executive (HSE) to ensure that the Long Term Illness card scheme does not discriminate on the basis of where an applicant lives. The Ombudsman’s report, ‘Local Rules for National Schemes – Inequities in the administration of the Long Term Illness Card Scheme’, follows a refusal by the HSE to award a Long Term Illness Card (LTI card) to a boy diagnosed with Attention Deficit Hyperactivity Disorder (ADHD). The HSE refused the LTI card on the grounds that the boy did not meet the medical criteria for eligibility. In her complaint to the Ombudsman, the boy’s mother, Ms Kelly (not her real name), contended that her son met the relevant medical criteria and she claimed that had he lived elsewhere in Ireland (he lives in Wexford), her son would have been awarded a LTI card. For more details please see the Ombudsman media release. A study of the impact of ADHD on the lives of adolescent girls, ages 14-18, is currently taking place under the direction of researcher Andrea Lynch at the National University of Ireland, Galway. Participants will be asked to complete one online questionaire & one personal interview regarding the ways in which they feel ADHD impacts their life & school experience. For more information on this study, please contact the researcher at a.lynch19@nuigalway.ie or 087-1129868. More information can be found on Facebook. Mon 23rd at 7 pm: Adults on the R/R programme. Tues 24th at 8 pm: Help for spouses and families of ADHD adults. For more information please contact INCADDS. Interview with MEP Nessa Childers (IRL) and Mary Baker, President European Brain Council, on the release of the white paper “ADHD – Making the Invisible Visible”. A transcript of the interview can be viewed here. Psychology student is seeking to interview adults who were diagnosed with ADHD as a child or as a teenager. The research goal is to assess the impacts of ADHD on everyday life relationships. Research is supervised by a university lecturer. The survey will take approximately 1 hour. Full anonymity will be assured. For further information or any questions please contact Anne at 087-9915050 or adhdresearchis@gmail.com. “Thinking and Decision making Workshop for Adults with ADHD. Starting April 8th 2013. 15 weeks duration. Neurofeedback: A Personal Story from MindscapesHealth. 9 am – 4 pm Friday October 5th, 2012. Contact INCADDS at (091) 755090 for more details. NUI Galway recently released a report titled ‘Making a Difference, An Independent Evaluation of the Incredible Years Programme in Pre-Schools in Galway City’, which documents significant changes in child behaviour as result of the programme. It also highlights the long-term benefit of such programmes in enhancing the ability of children to be ‘active participants’ in education and society throughout their lives. The Incredible Years Programme is an innovative programme that uses puppets to work with children between the ages of 3 and 5 to strengthen their social, emotional and academic competencies. Over 400 children from Galway City have participated in the programme. A copy of the Summary Report is available to download here. For further details on the programme and this report please contact a member of the Incredible Years Team. The ADHD Partnership Support Pack is a resource to help parents, carers and teachers from across Europe to work together in supporting school-age children with ADHD. It has been developed with assistance of the European ADHD Awareness Taskforce. See adhdpartnershipsupportpack.ie for further details. Ms. Aisling Parsons & Dr. Jessica Bramham are currently conducting research on ADHD in adulthood at the School of Psychology at University College Dublin (UCD) and Trinity College Institute of Neuroscience (TCIN). They are running a number of research projects at the moment. If you have a current diagnosis of ADHD and are over 18 years you can contact the researchers by e-mail: aisling.parsons@ucdconnect.ie or aislingparsons@gmail.com. Alternatively, phone the research line on 086 078 66 46 and they will send you more information about the research. 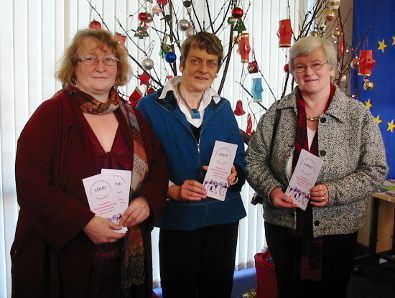 Launch of the AD/HD informations leaflets in Irish at Leabharlann na Ceathrun in Co.Galway, December 2009. Trinity College Institute of Neuroscience is conducting a study to examine the effects of a biofeedback-attentional training on adult ADHD patients. They are looking for adults, aged 18-50 years, who have been diagnosed with ADHD, to participate in this study. If you would like to participate or would like further information,please contact: Simona Salomone 01 896 8403, ssalomon@tcd.ie or Sophia Kilcullen 01 896 8403, sophia.kilcullen@gmail.com. 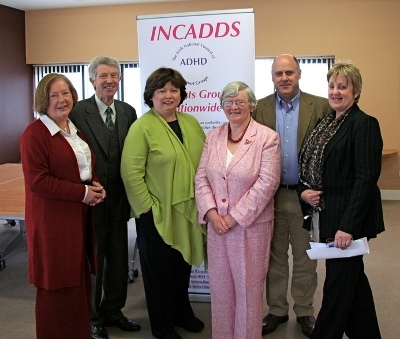 Mary Harney, Minister for Health and Children, visited the head office of INCADDS ( The Irish National Council of ADHD Support Groups) now open at Unit 17a at the Ballybane Enterprise Centre, Galway. Ms Harney is pictured at the centre with, from left: Bridget Kelly, Secretary (Limerick), Ray Kavanagh, Chairman, Rose Kavanagh, Galway, Noel Grealish TD, and Miriam Donnellan, Clare. Mental health care professionals, including psychologists and psychiatrists, frequently have little or no specialized training in treating Attention-Deficit/Hyperactivity Disorder (AD/HD), the most common lifelong mental health problem. In a newly published survey, Diagnosis&Treatment of AD/HD in Europe: Differences, Problems and Progress, ADHD-Europe examines provision for the treatment and diagnosis of AD/HD in 19 European countries. Despite some improvements, the survey found provision for AD/HD diagnosis and treatment in crisis. As demand for diagnostic assessment increases, European mental health professionals still receive little or no specialized training in the proper diagnosis and treatment of AD/HD, resulting in insufficient diagnostic services, long waiting times (children can wait for years), inadequate and inappropriate treatment availability for children and less for adults. Sometimes it is truly an uphill battle. Some health professionals still know very little about this disorder. Doctors, including psychiatrists and neurologists, look for psychological and/or educational causes. AD/HD is not caused by poor parenting, changes in the pace of modern society or too much television; it is a neurodevelopmental disorder with core symptoms of inattention and impulsivity, with or without hyperactivity. The causes are complex, but around 80 % of the risk factor is genetic, with approximately 5-6 % of children and 3-5 % of adults being thought to meet the DSM-IV TR diagnostic criteria. In addition to impairments resulting from these symptoms, sufferers and their families may also be affected by social stigma. Treatment offers children a release from the misery and isolation brought about by their behavioural symptoms, as well as improvements in family life and educational achievement. Untreated AD/HD can lead to pervasive lifetime impairment, but the outlook can be much improved with proper treatment. ADHD-Europe aisbl is a European non-profit umbrella organization which received full legal recognition in Belgium in April 2009. At present, ADHD-Europe represents 27 National and Regional organizations concerned with AD/HD from 19 countries who have worked together since 2005 for the improvement of the situation of those affected by AD/HD. The survey will be available on May 21, 2009 from ADHD-Europe aisbl, Avenskouter 13, B-9820 Merelbeke, Belgium. ADHD-Europe wants to raise public awareness about AD/HD and influence the European decision-makers on behalf of people affected by this disorder. ADHD-Europe will do this through the prevention of stigma and discriminatory practices and through the promotion of inclusive practices in the medical, family, school and labour settings across Europe. INCADDS head office now open at Unit 17a, Ballybane Enterprise Centre, Galway. First National ADHD Awareness Week launched 22nd September 2008. 83% of Irish parents of children diagnosed with Attention Deficit Hyperactivity Disorder (ADHD) reported that they often or always got stressed about their child’s condition. 79% reported that symptoms impact on family functioning. A further 69% of parents have difficulty getting their child ready in the morning and 58% reported difficulty with their child falling asleep at night. These new findings were revealed today at the launch of Ireland’s first national ADHD Awareness Week, a joint initiative of ADHD ACTION and INCADDS (Irish National Council of ADHD Support Groups). The Irish National ADHD Awareness Week is part of a larger Europe-wide ADHD Awareness Week aiming to increase knowledge of the signs and symptoms of ADHD, its impact on the ADHD child and their family and the support mechanisms available. The Awareness Week is taking place from the 22-28 September 2008. ADHD is a neurobiological condition affecting 3-7% of school children, roughly two children in every classroom. The core symptoms of ADHD include inattention, hyperactivity and impulsiveness which are not in keeping with those of the same age group and development level. For example, a child with ADHD is easily distracted, finds it difficult to complete tasks and has difficulty returning to the task, if distracted. He or she may also act impulsively, move and speak rapidly and excessively, and may often respond or act inappropriately, without thinking. The nationwide survey of 150 Irish parents of ADHD diagnosed children was part of Ireland’s first ever nationwide survey of this kind. Entitled ‘A survey of ADHD in Irish children’, the results together with information on the condition and local support groups operating in Ireland are available in book format. The research was conducted by ADHD ACTION, a multi-disciplinary group whose aim is to educate the general public, patients and health professionals on ADHD with the ultimate aim of improving quality of life for people with ADHD. ADHD ACTION is supported by an unrestricted educational grant from Eli Lilly & Co.
‘Bringing up a child with ADHD is not just a case of having to cope with them being fidgety or not being able to concentrate for half an hour or so. ADHD is a condition that affects all aspects the whole family’s life of the time. Education and life milestones are the most common cause for concern amongst parents. Lack of friends, aggressiveness and if they will ever lead a normal happy life are all issues parents are worried about,’ commented Ray Kavanagh, Chairman, INCADDS. 	87% of parents said that their child’s behavior brought ADHD to their attention with 60% mentioning schools. 	54% of parents were able to achieve a diagnosis for their child locally, the remainder had to seek diagnosis outside of their area or they were referred to a central hospital. 	75% of parents whose children had been diagnosed with ADHD stated that their child had been diagnosed with another condition. 	47% of parents agree that teachers really help their child out. 	Parent and advocacy groups were cited as the best source of information and the greatest help with 75% in agreement, the internet was next at 48%. For further information contact adhdaction@fleishmaneurope.com or Tel 01 6188479.